Astah Viewer is now on Gadget! 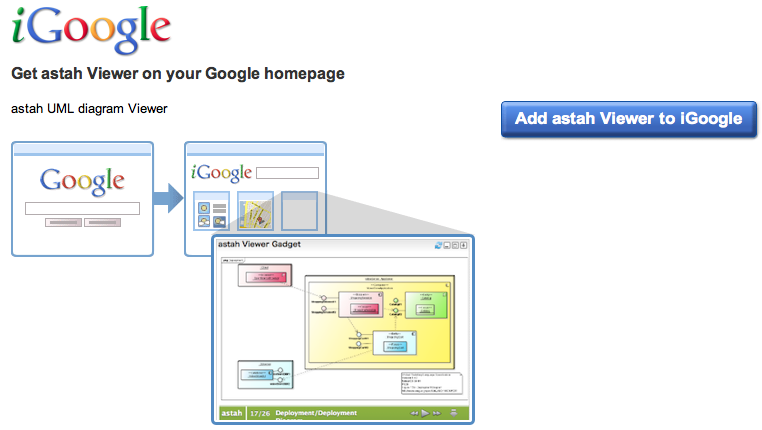 Introducing another option to view Astah diagrams! My colleague and one of Astah development members, Sho Ito (@shoito) has created an “Astah Viewer” OpenSocial Gadget called “Astah Viewer Gadget”. 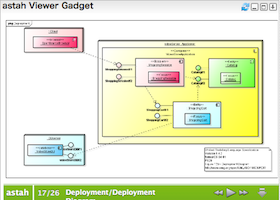 You can view diagram images created by Astah such as UML, ERD, Mind Map, Requirement diagrams and others on a Gadget on iGoogle, infoScoop or any other services you can use Open Social gadgets with. The original post (Japanese) is on https://github.com/shoito/astah-gadget. With his permission, here is a step to use the Astah Viewer Gadget in English. 3. Enter the URL you received from Astah Publish (e.g. http://p.astah.net/a/dademo) and done! If you have any comments or feedback about this gadget, please tweet them out to Sho Ito (@shoito)! 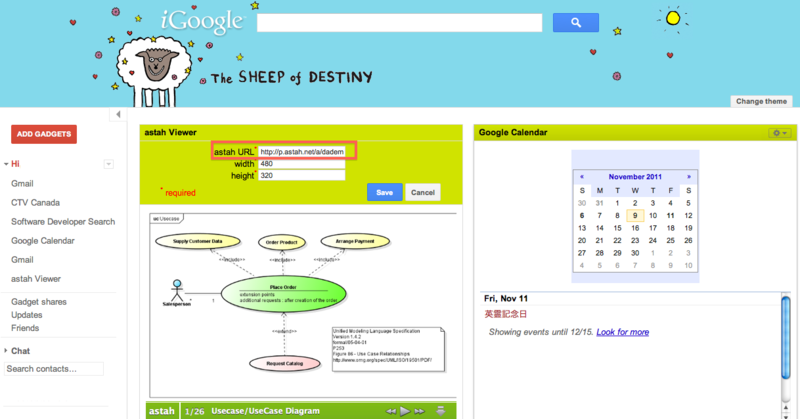 This entry was posted in Share diagrams, UML and tagged astah, Gadget, iGoogle, opensocial, Publish, Share, Viewer. Bookmark the permalink.